A police officer and one other person were killed on the Virginia Tech campus on Thursday, according to university officials. The incident took place on the same campus where the deadliest shooting in modern U.S. history occurred back in 2007. In a statement posted on its website, the school reported that shortly after noon, a Virginia Tech police officer made a traffic stop. The officer was then shot and killed, according to witnesses. During a press conference Thursday afternoon, authorities said the gunman was not believed to have been involved in the traffic stop. The shooter fled on foot toward another parking lot, where a second body was later recovered. At the press conference, school officials and law enforcement authorities declined to identify the second person found dead as the gunman. However a law enforcement source speaking on the condition of anonymity told The Associated Press that the second body is believed to be the remains of the suspect. Following the shootings, the campus was put on lockdown and students were urged to remain indoors. At 4:31 p.m., the lockdown was lifted. The suspect is described as a white male, wearing "gray sweat pants, gray hat w/neon green brim, maroon hoodie and backpack," according to a 12:47 p.m. tweet from the university's VT Alerts notification system. Law enforcement from several agencies responded with Virginia state police taking the lead in the investigation. 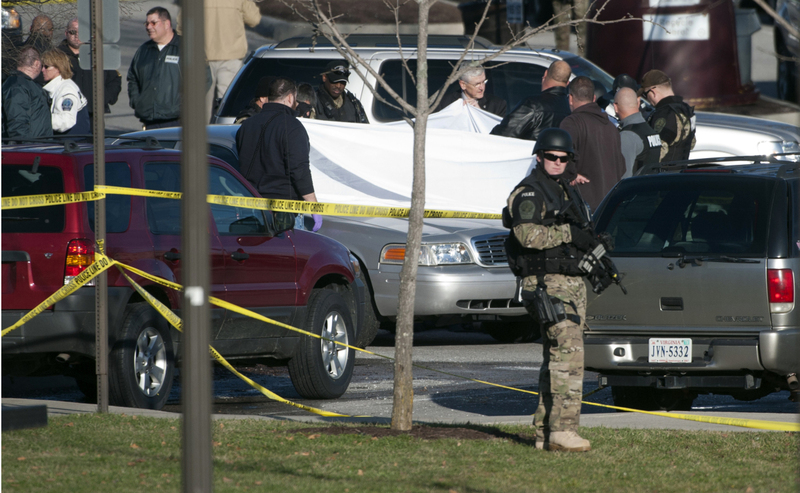 The AP adds that it was the first gunfire on campus since 33 people were killed in 2007. The deaths came on the same day that Virginia Tech's police chief testified in DC about how the school handled the 2007 shooting. The university is facing charges of failure to issue a timely warning and failure to follow its own procedures for providing notification. Thursday was a "study" day for Virginia Tech students in preparation for final exams, which were to begin Friday. Final exams have been postponed for now. This is a developing story.. More information to come..